Your enjoyment of Ant-Man and the Wasp will probably mirror how you felt about the first Ant-Man, because this sequel is more of the same. It’s breezy and a lot of fun, and much lighter than some of Marvel’s more recent output. Far away from the cosmic apocalyptics of Avengers: Infinity War, it’s a film of low stakes and lower ambition. It’s not without issues, and those are primarily at the script level. For one, Ant-Man and the Wasp is frequently bogged down by nonsensical sci-fi jargon that even actors like Michael Douglas and Laurence Fishburne can’t make sound natural. But the plot revolves almost entirely on three parties competing for a MacGuffin in the form of Hank Pym’s (Douglas) shrunken laboratory, which houses technology capable of accessing the quantum realm. It’s not big on ideas, so, as a sci-fi film it has little to offer. But as an action-adventure film it excels. 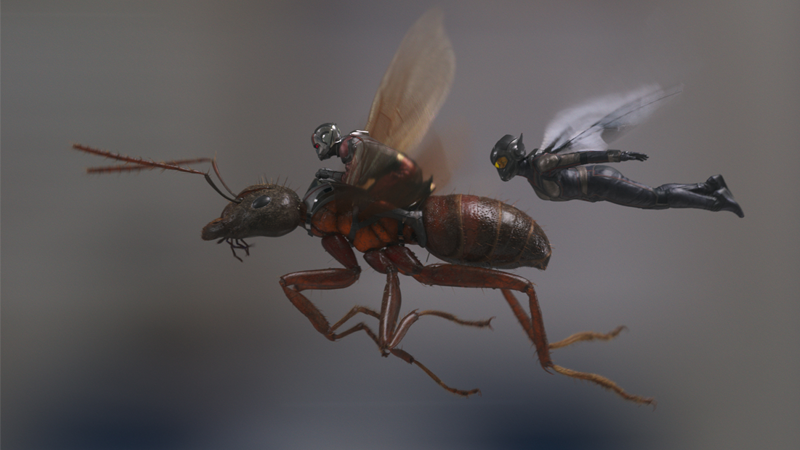 At times, Ant-Man and the Wasp plays like an 80s action flick, other times like a buddy movie, and frequently like a classic screwball comedy. It’s plot is light-footed and inconsequential, but the film is high on personality. Paul Rudd and Evangeline Lilly are effortless in their charm. Abby Ryder Fortson is also a lot of fun as Lang’s daughter Cassie, and theirs is one of a few different parent-child relationships that anchor the film with a human story. Most of the cast of the first film is back, including Scott Lang’s former criminal accomplices (Michael Peña, David Dastmalchian & T.I. ), now attempting to go straight with their own security business. Peña’s character Luis retains all the qualities that made Peña the MVP of the first Ant-Man, but he gets a run for his money from Randall Park, who steals the show as Woo, an FBI agent tasked with monitoring Lang’s house arrest. I hope they bring Agent Woo back in the Marvel Cinematic Universe as a recurring side character like Phil Coulson or Jasper Sitwell. There’s no true villain here—Walton Goggins’ black market businessman Sonny Burch comes closest—, but Hannah John-Kamen’s Ghost offers an interesting alternative antagonist of the kind Marvel has been getting better at lately. Her subplot is a bit clunky and could have been developed better, but her presence is a boon to the film, as are the ‘ghosting’ effects when she phases through people and objects. Visually, there’s a lot to love here, not just in terms of gags, but with the ghosting and size-shifting abilities cleverly employed in service of some really fun action sequences. When characters do travel to the quantum realm, it offers the most surreal visual landscapes since Doctor Strange. Does it feel slight? Sure, but in a landscape of superhero movies that so frequently threaten the extinction of the world, sometimes a movie that prioritizes having fun and telling a small story about parental love is a breath of fresh air. Your last paragraph is a good summary of why this film was such a welcome surprise. Liked it a lot more than I expected.